We're back from that little break to the China travel diaries! If you haven't been updated on the last travel diary, I highly encourage you to do so. The last travel diary was about the Yellow Crane Tower in Wuhan. Today we're in Beijing, taking in the Temple of Heaven. 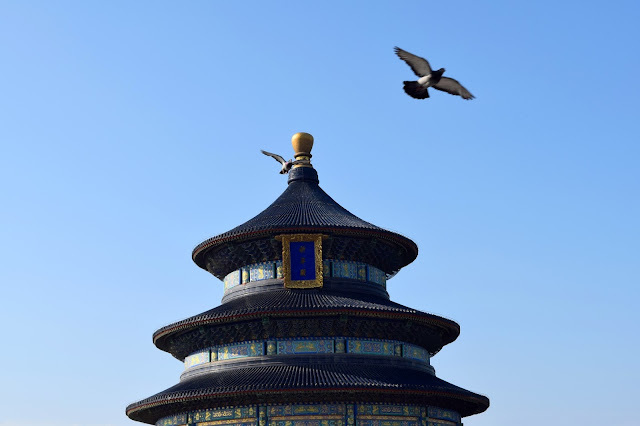 The Temple of Heaven was the first stop upon my arrival in Beijing. From Wuhan, we took a night train to Beijing. Honestly, it's probably my new favorite mode of transportation. There were bunk beds in there and it was nice and roomy, which was so refreshing after going through long plane rides. It was like I fell asleep one moment and the next, we were in Beijing. Although it was a nice comfy ride, I still didn't get as much sleep as I would have liked, considering I went to sleep a bit late and the train arrived at around 6:30 in the morning. 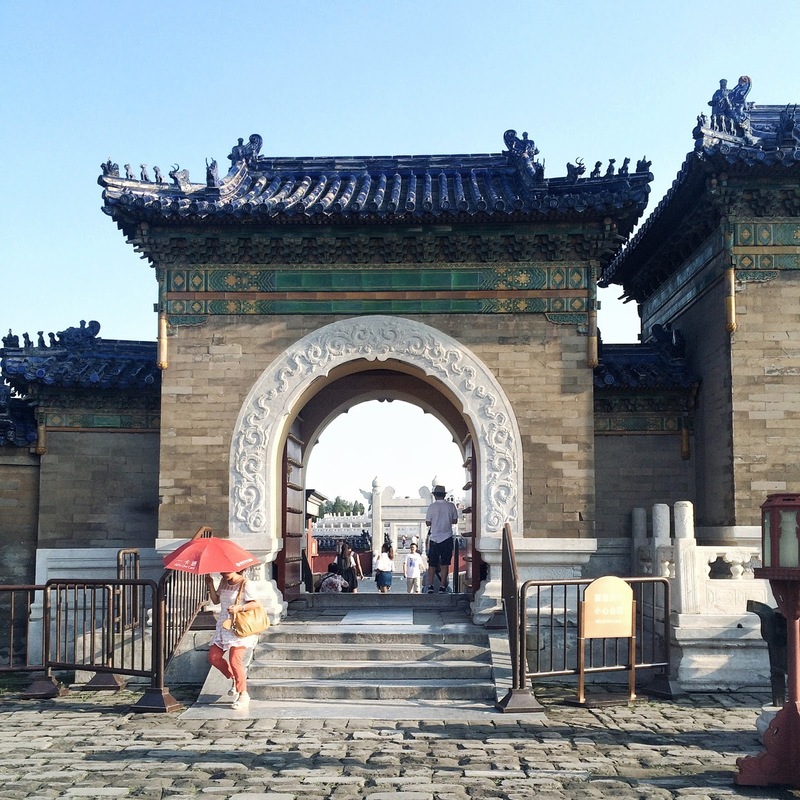 Because of that, we only went to the Temple of Heaven and a park. I'm not sure what the name of the park we went to was, but it was definitely a nice place. There were bridges and street vendors by the water. My friends bought some souvenirs, like Chinese paper cutting pop up cards and we bought some food and drinks to enjoy. I bought a Chinese fan, since it was so hot that I needed it to stay cool. On the day that we went to the Temple of Heaven, it was hot but bearable. Most of the days in China were sweltering, but that day was decent in terms of weather. As you can tell from the pictures, there were blue skies and lots of sun. 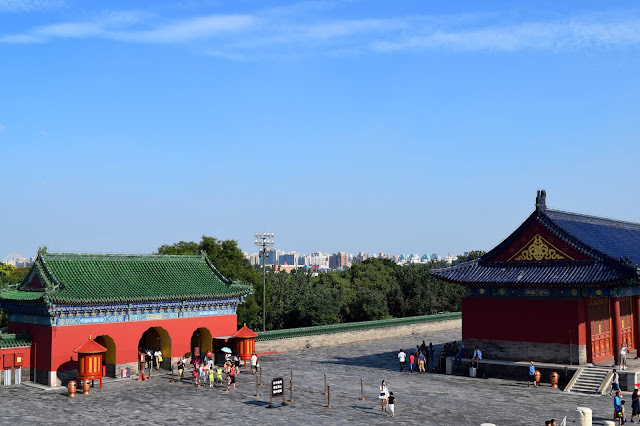 Most of our time at the Temple of Heaven was spent taking pictures, but there was also a museum of such inside one of the buildings and you could also see inside the center temple. It was dark inside, but you could still get a glimpse. History corner: Founded in the first half of the the fifteenth century, the layout and the buildings symbolize the relationship between the heavens and the earth. It was later extended in the sixteenth century and further renovated in the eighteenth century. 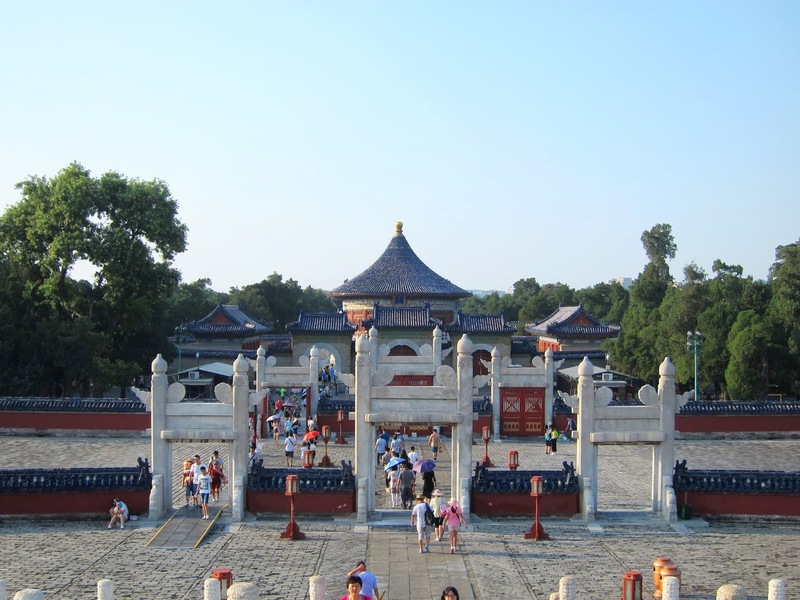 The Ming Dynasty and Qing Dynasty emperors used the temple to hold the Heaven Worship Ceremony. The Northern part symbolizes the heavens and the Southern part symbolizes the earth. The designs reflect this, with the heavens high and the earth low. It also reflects the ancient Chinese idea that the heavens are round and the earth is square. Learn more about the Temple of Heaven here! From the raised platform, there is a nice view of the city. For the most part, it's just a view of the buildings and the skyline, but because the day was so beautiful, with blue skies, it was an even prettier view. After we walked around the Temple of Heaven, which is actually four times the size of the Forbidden City, we were hot and tired. We returned to the hotel early, but not before having a delicious dinner. All of our dinners is Beijing were so satisfying, with family style dinners, and always ending with fresh watermelon. And that's a wrap for the Temple of Heaven! Next week we're continuing the journey of the China Travel Diaries with the famous Great Wall of China. If you're not updated on how the China travel diaries will work, I'm posting China travel diaries every Wednesday until I've finished the travel recap. Although there were some other moments in China that were still amazing, I'm posting the tourism parts so that I can share my input on the classics but also show off these great pictures. Can you do a post about time management? That's a great idea, I'll consider doing a post like that in the future!